Aged 18 months in French oak barrels, this 2014 Valpolicealla Ripasso is a true gem! Unique in its class, Le Muraie is a Valpolicella Ripasso or refermented. 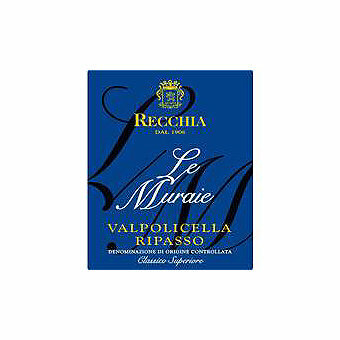 Recchia makes their Valpolicella Classico Superiore in the traditional fashion but then they referment it by adding the lees of their very rare and rich Recioto di Valpolicella. The process is slow and exacted and the result is a finished wine with the charm and refinement of Valpolicella Classico but it's become full-bodied, with added richness and depth. The grapes are 75% Corvina Veronese, 10% Corvinone, 10% Rondinella, 5% Oseleta plus Merlot and Croatina grown on natural terraces supported by dry stone walls, known as "Marogne". The wine is aged 18 months in French oak barrels. It is a true gem.